I never understood why it happened – seemed a backward step at the time – but circa ten years ago the famous St Hugo label was subsumed (as Halliday calls it) into the Jacobs Creek range. Of course I’m being dramatic, but gee it pleases me to see no trace of Jacobs Creek on this St Hugo Shiraz. Not that Jacobs Creek isn’t a great brand – it’s an Australian icon really – but it’s just not perceived as a premium enough wine brand. Thankfully the team at Pernod Ricard have seen the light, and now St Hugo not only has it’s own brand back, but there is a brand-new, dedicated St Hugo winery also nearing completion in the Barossa. 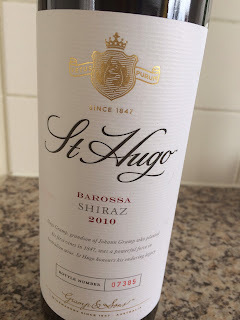 Whilst this St Hugo Shiraz is sadly not from Coonawarra (and not a Cabernet Sauvignon) it is a welcome relative to the St Hugo Coonawarra red – a classic, ‘Valley Floor’ red, full of the enveloping richness found in Shiraz from the Tanunda end of the Barossa (for the record it is composed of 15 parcels from all over the Barossa Valley), the wine carrying lots of everything (flavour, tannins, oak etc). Purple in colour, purple in flavours, the oak is a little intrusive and choc-vanillan at the moment (80% French oak apparently) but it tastes so utterly Barossan that you can sort of forgive that. Alcohol is not obtrusive either. Composed, hearty, oaky and delicious, this full bodied tastes like the sort of trophy-winning, critic-slaying Orlando Barossan reds of the 90s. Sure it has no subtlety, but lovers of the style don’t really need (or want) that. Would I buy it? I’d drink this. Maybe not finish a bottle, but with fat sausages (not thin), white bread and tomato sauce it would look mighty drinkable. Ha! The food match is fantastic! Onya! Kudos! No. Should be in a good place.